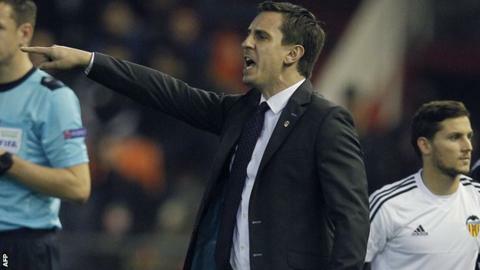 Gary Neville claimed the obituaries for his time as Valencia boss have already been written following a 1-0 La Liga defeat at lowly Real Betis. Neville, whose side was thrashed 7-0 by Barcelona in a midweek Copa del Rey tie, is yet to see his side win in nine league games but again refused to quit. The ex-England international, who was appointed at the start of December, said: "I said before I came that I would be judged in five months. "I have been judged in six weeks." Former Valencia goalkeeper and captain Santiago Canizares - as well as some supporters - called for Neville to stand down after the Copa del Rey hammering by Barcelona. Under Neville, Valencia have lost four and drawn five league games to slip to within four points of La Liga's bottom three, although the 40-year-old insists he is not contemplating the threat of relegation. He added: "It's clear that we are better than some of the teams we are playing against. "Our last two league matches were not performances that deserved two defeats, but the reality is that they are two defeats and I am aware of the consequences when you don't get good results. What matters are results. "There's no doubt that at times like this everyone needs to stay together. "Everyone suffers. It's just not going for us at the moment. I continue to work, I continue to have belief. "Conversations with the owners are between me and the owners. We have to turn it round quickly, I understand that. It is hard to explain the defeat. It will turn." Neville claimed that the Valencia players are now much fitter and better organised than the team he inherited, which he said was "all over the place". He admitted every defeat felt like a "punch in the face" but said there was no need for the owners, who include his business partner Peter Lim, to make any statement on his position. Former Manchester City striker Alvaro Negredo, who missed Valencia's best chance to avoid becoming only the second team to lose a league fixture at Real Betis this season, would not be drawn on the manager's future. Negredo said: "That's not up to me. We know the coach well, but that's up to the club. We shouldn't get involved in things that we aren't supposed to."